SLJO performs at weddings, charity events, corporate functions and music festivals across the country. To book the full jazz orchestra or a smaller ensemble, please fill out our booking form. Whether you're an active musician or a comeback player looking for a Big Band to join, fill out our online form and we'll be in touch soon. Get to know the SLJO by checking out our range of audio and video clips, photos and the Latest News page. South London Jazz Orchestra is a diverse group of talented musicians. 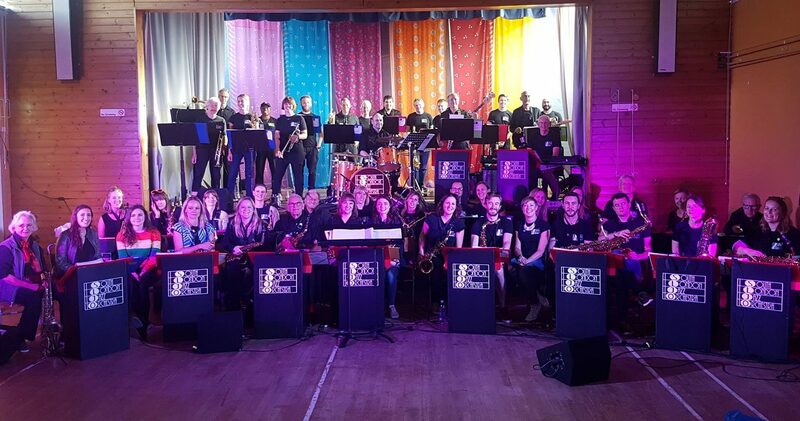 Our aim is to share our love of Big Band jazz with the community, help raise money for charity, and have as much fun as possible while doing so. SLJO was set up in 2000 by Paul Millington and Bob Bridges, our conductor until 2018, and operates as part of South London Community Music, alongside concert band South London Symphonic Winds and choir London Sings! We are based in Brixton and play over thirty gigs a year all around London and further afield. You will find us at the London Marathon and up on the bandstands in three Royal Parks – Hyde Park, Regents Park, Greenwich Park – as well as local favourite Ruskin Park. We love a good party. SLJO regularly plays the Edinburgh Fringe Festival, Brighton Fringe Festival, and Wandsworth Arts Fringe. We’ve entertained both beer festivals and neighbourhood fetes. We also like a road trip and in 2018 are going on tour to Bath to help Bath Community Big Band celebrate its 18th birthday. In past years, we have toured Europe, going to Belgium, Germany and Switzerland. SLJO also performs at private functions such as weddings, birthday parties and award ceremonies. An SLJO ensemble is tailored to the event and size of the venue. Our “mini-SLJO” series of smaller ensembles has been a hit in pubs and jazz clubs around London. Recent appearances have been at Hideaway in Streatham, Toulouse Lautrec Jazz Club in Kennington, Ivy House pub in Nunhead, White Hart in Crystal Palace and Old Brewery in Greenwich. If you are an active musician, or a even comeback player, looking for a Big Band to join, let us know by completing our online membership form. You can also visit our rehearsals page to find out about our repertoire, rehearsal location, times and more. We operate a unique no-auditions policy. We invite you to browse around the website to find out more about us. You can also read our newsletters – Winter and Summer 2017 and Winter Autumn Summer and Spring 2016 – and sign up on the right to receive future newsletters by email.